Increasingly your association members are interacting internationally, either in person, through email exchanges, or over the phone. Shouldn’t your organization be part of the conversation? 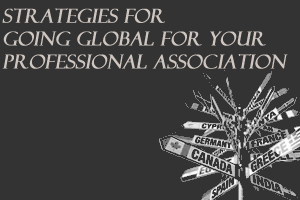 A Campbell & Company webinar drove home the idea that global positioning could be part of your long-term strategy, not only to enhance your visibility and influence within your industry but also to expand your membership as well as increased philanthropic income and corporate sponsorship.